Even with a high unemployment rate, you can always count on one company to be hiring: the United States Military. All branches of the armed forces are meeting or exceeding their 2009 recruitment goals, and active duty branches of the military are up almost 6,000 recruits over April of last year, an increase of 7%. This isn't an unexpected bump, Former Under Secretary of Defense Personnel And Readiness, Dr. David Chu told Congress in October that armed forces, "benefit when things look less positive in civil society." Lest we forget the recession isn't limited to America, the India Times is reporting that the British Army's recruitment was up 14% from last year, as thousands of young Britons turn to the military due to poor job prospects in the private sector. An uptick in visits to recruitment offices of 20-25% was first noticed in January, and combined with fewer people leaving, these forces will likely lead to a full-strength British Army by 2011. Dr. Chu provided a corollary between the economy and recruitment in the U.S. during his recent testimony to congress; "So what difficult economic times give us, I think, is an opening to make our case to people who we might not otherwise have. And if we make our case, I think we can be successful." An additional contributing factor to the increase of new recruits since the economy took a nose dive has been an increase in support by older Americans; a factor which jumped from a one- third approval rating to almost two thirds, according to the military's latest poll. 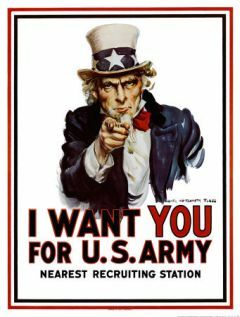 However you look at it, this surge in recruits will be welcome news to the military officials and to the current troops who are serving second and third tours of duty in the Middle East.